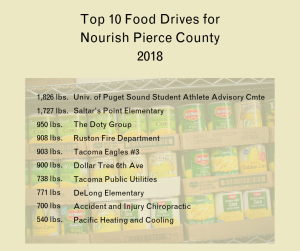 In 2018, more than 80 organizations, businesses and schools hosted a food drive to benefit Nourish. We are so grateful for the outpouring of support. Food drives help us add diversity to what we offer our clients. Since so much of the food we receive is in bulk, food drives allow us to add special or unique items to our food bank shelves. Usually food drives are paired with fund drives, and we receive a generous donation in addition to the collected food. The top 10 groups donated nearly five tons of food to Nourish in 2018! To organize your own food drive, visit our Food and Fund Drive page.